Dylan Morgan sits down after spelling the winning word in the 11th annual Watertown Daily Times Spelling Bee. Michael Price, who was the second place speller, claps for Dylan. 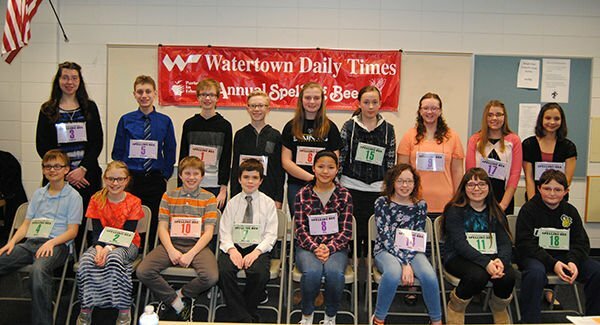 The Watertown Daily Times annual Spelling Bee was held Tuesday night at Watertown High School. The spellers are from back, left: Sophia Bittorf, Garrett Heth, Skylar Morgan, Zander Koellen, Madeline Kilps, Anna Schmid, Kayla Fillmore, Anna Huffstutler and Mikaylah Fessler. Front row, Dylan Morgan, Mary Ann Lazzell, Tim Riley, Michael Price, Ava Ashenfelter, Lilly Walrath, Briana Moreno and Nathaniel Kilps. It was all about the sixth-graders Tuesday Night during the Watertown Daily Times 11th annual Spelling Bee. 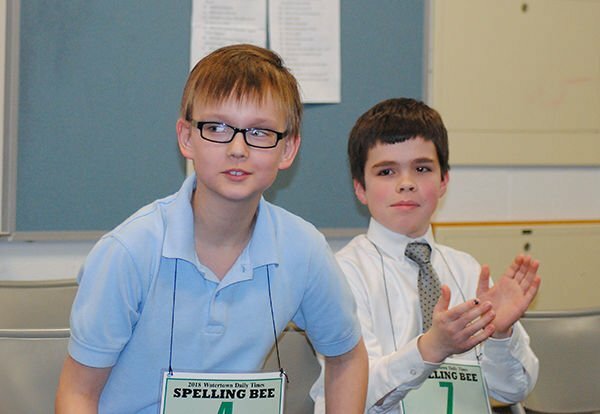 Dylan Morgan, sixth-grade student at Riverside Middle School bested another sixth-grader, Michael Price from Calvary Baptist Christian School to win the bee with the word magnanimous. Dylan spent a lot of time practicing the words for the bee. "Since we got the list I've studied at home each day and read them over with my mom." Dylan said the word miscellaneous almost tripped him up. "It was pretty hard, but I got it right." Price said he spent a lot of time practicing and was feeling pretty confident. Dylan thought his sister Skylar Morgan would win he said. She was this year's eighth-grade champion and last years seventh-grade champion. Dylan hopes to get another win in seventh grade. Dylan received $75 for taking home the top prize and will have the traveling trophy displayed at Riverside Middle School. The top speller of each grade received a $50 check. There were 17 rounds of competition. Jackie Rosinski, Newspapers in Education Coordinator said, "Everyone did well on their written test and it was exciting to see how well all the kids spelled tonight. There were quite a few new spellers and seven spellers returning from last year." Other students who participated in the event were: Mary Ann Lazzell, Calvary; Sophia Bittorf, Trinity-St. Luke's; Garrett Heth, Calvary; Madeline Kilps, Watertown Catholic; Ava Ashenfelter, Riverside; Kaylea Fillmore, Watertown resident; Tim Riley, Calvary; Briana Moreno, Watertown Catholic; Mikaylah Fessler, Riverside; Lilly Walrath, Riverside; Anna Schmid, Calvary; Anna Huffstutler (seventh-grade winner), Calvary and Nathaniel Kilps, Riverside. Judy Kluetzman was the emcee for the night and Kay MacAskill was the recorder. The judges were Jane Aschenbrenner and Frances Milburn, retired teachers. Luther Preparatory School English teacher Brian Maurice was the pronouncer for this year's competition.